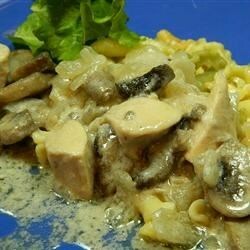 "This is less a version of the traditional 'chicken marsala,' than a chicken casserole with Marsala wine in it. Serve with mashed potatoes or wide egg noodles." Preheat oven to 350 degrees F (175 degrees C). Prepare a large baking dish with cooking spray. Melt butter in a skillet over medium heat. Cook and stir mushrooms and onion in butter until the onion is translucent, about 5 minutes. Stir cream of mushroom soup, chicken broth, and Marsala wine together in a large bowl. Stir mushroom mixture into soup mixture. Spread chicken pieces into prepared baking dish; season with salt and pepper. Pour soup mixture over the chicken and cover the dish with aluminum foil. Bake in preheated oven until the chicken is no longer pink at the bone and the juices run clear, about 90 minutes. An instant-read thermometer inserted near the bone should read 165 degrees F (74 degrees C). Flavor was good, but the sauce needed to be thicker. Would doctor it up if I make it again.